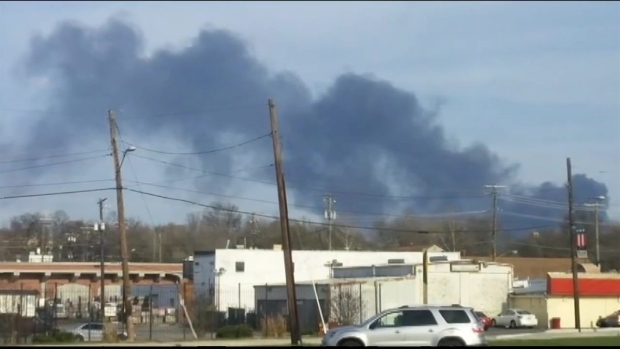 A three-alarm fire at a roofing company in Capitol Heights, Maryland, sent a thick, black plume of smoke billowing into the sky Monday afternoon. Containers of Styrofoam behind a warehouse in the 8700 block of Ashwood Drive caught fire and spread to other things, like wooden pallets. The fire destroyed two fire trucks when propane tanks began exploding as the wind shifted, blowing flames over the trucks. Firefighters attempted to back the vehicles out, but they were too late. 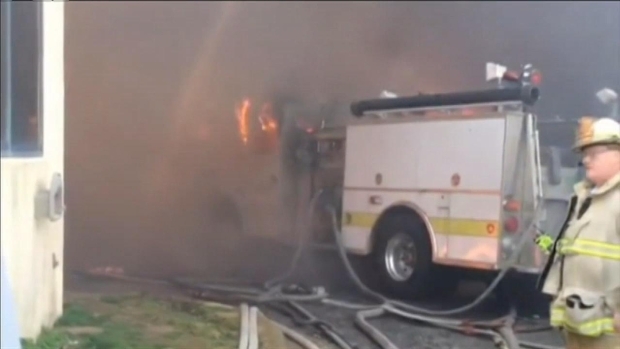 “You’re talking about close to a million and a half dollars in fire apparatus alone that has been lost in this fire,” Prince George's County Fire spokesman Mark Brady said. A three-alarm fire at a roofing company in Capitol Heights, Maryland, sent a thick, black plume of smoke billowing into the sky Monday afternoon. Jackie Bensen reports. A fire engine from the West Lanham Hills Volunteer Fire Department and a Rescue Engine from the Kentland Volunteer Fire Department were a total loss. No serious injuries were reported. Two firefighters were treated for minor burns and released. "We lose some brush jeeps and some four-wheel-drive pickup trucks in the wooded areas when we fight brush fires, but on a structural fire, this is the first time in Prince George's County that I can remember losing a piece of fire apparatus on a fire," Brady said. News4's Chris Lawrence got reaction to the warehouse fire in Capitol Heights that was visible for miles. Despite challenges presented to firefighters by the wind, it blew the fire away from the warehouse. Firefighters were still putting out hotspots late Monday. The large plume of smoke was visible to baseball fans at Nationals Park 10 miles to the east.